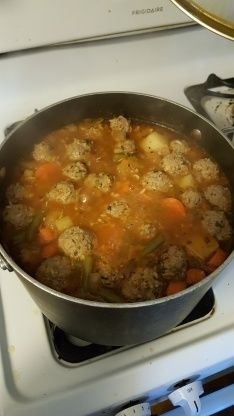 This albondigas soup recipe was given to me from my mother-in-law. It's definitely one my favorite soups. Honestly, it's better than most restaurants that I've tried. Make the meatballs first: Combine everything and mix thoroughly. Form meatballs and roll between your palms (Otherwise, meatballs will fall apart in the soup). You should make around 20 to 24 meatballs, set aside.